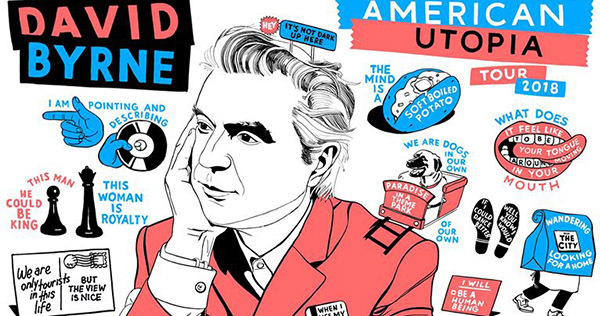 David Byrne’s performance at the Sacramento Community Theater on Aug. 21 was brilliant. 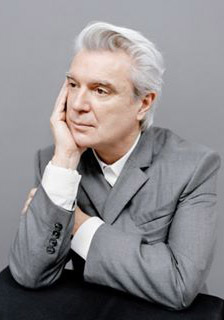 The delicate dance between psychosis and brilliance has seldom been executed better than by David Byrne. His 40-plus year music career is shrouded with rhythmic riddles, as ambiguous to definition as he is. Some argue punk/pop, some claim abstract funk, but it is more than apparent that his catalogue of music is beyond confining. Combine completely unique material, exquisitely executed choreography and theatrics with the musicianship of 14 accomplished players and an unparalleled live performance is achieved. His latest stop was Tuesday, Aug.21, at the Sacramento Community Theater. Reminiscent of the iconic 1980s Talking Heads performance, “Stop Making Sense,” Byrne starts the show alone. He sits at a desk with his Warhol-esque white hair radiating in the light. He begins singing softly to the immediately entranced audience with a human brain in his hand while walls of sequence rise around him, captivating the crowd with a new but strangely familiar scene. Filtering through the glittering walls of light, he’s joined by his bandmates, and from there the format of the past is forgotten quickly. The desk is emptied from the stage and all that remains is his orchestra of musicians. Resembling a funky marching band from the future of the 1980s, their presence is amplified by a stage that has no cords, no gear, no effects, a dozen-plus humans dancing free of restraint. But certainly not free of planning. Every hand movement, head shake, foot placement, note bend, drum hit, is perfectly designed to enhance the music and simultaneously never distract. His theatrical blend of songs of the past and the present paint an abstract picture that becomes more clear as the artist’s opus comes to its powerfully evocative close. The delivery of every single facet of the show was so perfectly precise, I can’t decide if I saw one of the best rock concerts ever or the funkiest broadway musical in history. Either way, it can’t be overstated, this performance was one of the greatest I’ve had the pleasure of attending. Dan Green is a journalist from the Lake Tahoe area. An active musician for more than 15 years, he brings his seasoned and unique musical perspective to his interviews and articles. He is a guitarist and vocalist for Black Star Safari and Ten Foot Tiger. He now resides in Sacramento.